Clerics, including Archbishop Emeritus Desmond Tutu, say President Jacob Zuma has a duty to answer South Africans’ concerns about Nkandla. s findings in a report on the more than R200 million spent on upgradesNatal homestead.Madonsela’s report calls on the president to pay back some of the money spent on his lavish homestead, account to Parliament and discipline his ministers. It found that Zuma violated the Executive Ethics Code of South Africa and benefitted from the upgrades to his home. Clerics held banners aloft, some reading, “The president must respond”, before Archbishop of Cape Town Thabo Makgoba prayed for healing countrywide. The vigil follows the release of the Public Protector’s report last week. 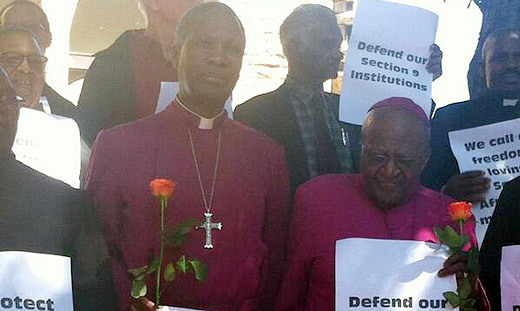 Makgoba says the church cannot afford to be silent when wrongdoing persists. 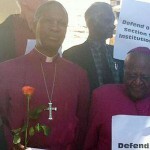 Archbishop Desmond Tutu shared similar sentiments. Before ending in prayer, the pastors and reverends said they hoped Zuma and Parliament would implement the report’s recommendations. And as criticism mounts over the president’s conduct during the upgrades to his Nkandla home, the African National Congress (ANC)’s highest decision making body is expected to discuss the issue today. The last nine days have seen huge anger at how so much of government’s money was spent on the president’s home and several senior veteran ANC members have joined the strong criticism. But it’s within this National Executive Committee (NEC) meeting that Zuma may feel the most comfortable. Most of its members support him, as they were essentially elected on his ticket at the ANC’s Mangaung conference. The ANC itself, its leagues, the Congress of South African Trade Unions (Cosatu) and the South African Communist Party (SACP) have all voiced their public support for him. They’re unlikely to change that stance now when Zuma himself will be selecting a new cabinet in just two months’ time. Meanwhile, former Intelligence Minister Ronnie Kasrils has described continued attacks on the Public Protector as ‘outrageous’, ‘disgusting’ and ‘highly dangerous’. Over the past 24 hours ANC heavyweight Pallo Jordan and renowned human rights lawyer George Bizos have also spoken out about the Nkandla scandal. The president has six days left to respond to Madonsela’s findings. Kasrils says government leaders are in denial about corruption levels while the ANC is self-destructing, damaging the country in the process. “For the ANC now, to undermine the Public Protector in this way, to threaten her in this arrogant, bullying manner is despicable.” When asked what he would do if he were in Zuma’s shoes, Kasrils says an ANC president has offered to resign before and that the president needs to wrestle with this idea. On Thursday news emerged that a group from KwaZulu-Natal was planning to approach a high court, to try and have the Nkandla report set aside. But Madonsela has said she is ready to defend her findings. Click here to view the full Nkandla report.